We have a number of people who need our help in remote Australia. If you’re already registered as a Volunteer and you see a job or placement that you’d like to take on then we’d love to hear from you. NSW - GONGOLGON - Do you have mechanical skills and can assist Pamela and Aaron? Activities: Pamela and Aaron could really use your help. As you can imagine, it does get tough when you’re trying to run a farm and your truck doesn’t work. If you have the mechanical know how to help Pamela and Aaron, this could be your chance. They are both facing health challenges that affects their daily ability to run the property and with Aaron going into surgery soon, it’s only going to get harder for Pamela. If you or someone that you know is available to lend a hand, please contact us! NSW - GULARGAMBONE - Would you be able to lend Sue a hand? Activities: Ever since Sue’s husband passed away 5 years ago things around the house have been a little harder when you’re doing it alone. Sue’s roof is falling apart and she needs your help to fix it. Your jobs will include: Re-stumping, building, painting, fixing fences, farm work & gardening. NSW - NYMAGEE - Can you lend a mechanical hand to Bill? Activities: Bill has reached out to us looking for some mechanical support. He has mentioned a number of jobs including FRONT END LOADER AND DIESEL DOZERS, WATER PUMPS, STEERING CLUTCH, LEAKY HYDRAULIC SEALS, CENTRE BEARINGS, TIE ROD END AND BEARING, WATER PUMP DOWN AT THE DAM DOESN’T START VERY EASILY, SERVICING OF SMALL MOTORS SUCH AS GENERATORS AND FIRE STARTERS AND SERVICING OF MOTORBIKE AND QUADS. If you are mechanically minded, reasonably self-sufficient and would like to lend a hand and put your skills to great use, please do reach out! QLD - CLERMONT - Are you able to assist Carl and Andrea keep up after an accident? Activities: Carl and Andrea have reached out for your support around the house with cooking, cleaning and other household duties as Andrea unfortunately has broken her foot recently. She is limited with what she is physically able to do and Carl is just about managing to keep up with their cattle property which Andrea would normally help him with. Their home, as well as the accommodation they have available to you, are both air conditioned to make your stay as comfortable as possible in this relentless drought and already hot, summer days. 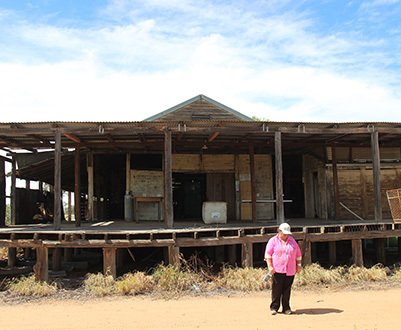 QLD - CUNNAMULLA - Are you able to assist Robyn and her family fight to stay on their property? Activities: Robyn has reached out to you for support during this super tough time out on the land. The drought is beating them down both physically and financially. She is trying to manage a 70,000 acre sheep station with only 1 employee and the pressure is intense. There is anxiety around getting fencing done to stop the wild dogs, but it is financially difficult to pay wages. She is fighting to keep her property which has been in her family for 95 years. They are looking for support with fencing, drilling holes, tying wire, driving ute or tractor with equipment on board. Perhaps driving a dozer to harvest trees for the starving sheep and cattle to eat. it is not absolutely necessary, however mechanical knowledge is always a massive bonus on a property. Ride a bike to muster if able. The work would be varied to suit. She has a tourism side to her property as well to try and create some cash flow so assistance with that during the busy times would be great also. If you are looking to make a real and practical difference in the lives of our drought affected farmers, this is the placement for you! QLD - DIRRANBANDI - Can you spend a few days property sitting and looking after the gardens? Activities: Helen has recently lost a close family member and has asked for our assistance in taking care of the property. Your duties will include general caretaking of the property and gardens. If you could only a spend a few days on your way through, that would absolutely be a great option and provide Helen the support and peace of mind she is looking for right now. QLD - DIRRANBANDI - Do you want to get your hands dirty and help Shelley and her family? Activities: Shelley, her husband Malcolm and their 3 kids would love your help in making their house a home and helping them move along some maintenance jobs that have been going on for 5 years. They are looking for help with some internal and external painting, some sanding as well as no-more gaping all the tongue and groove walls and ceilings. This will have a massive impact as the gaps are letting dust inside which is far from ideal. There is also some work in the garden to be done to prepare for a vegetable garden and orchard. This will include some digging. If this is something that you or someone that you know would be interested in, please let us know! QLD - GIN GIN - Can you support John to get his fencing up? Activities: John and Alison are getting back up on their feet after losing their beloved property recently. In addition to having cattle, they have started up a fencing business to help make a living. They would so greatly appreciate some strong, helping hands to assist with cutting and stacking fence posts which is physically demanding work. There is also fencing to do which worries John a lot. He just doesn’t have the capacity to do it all. Their living arrangements on the property are minimal so Alison is staying in town and commutes out to the property daily. Best option is to BYO caravan, stay in town also and go out to the property daily which is about 20-30 minutes one way. 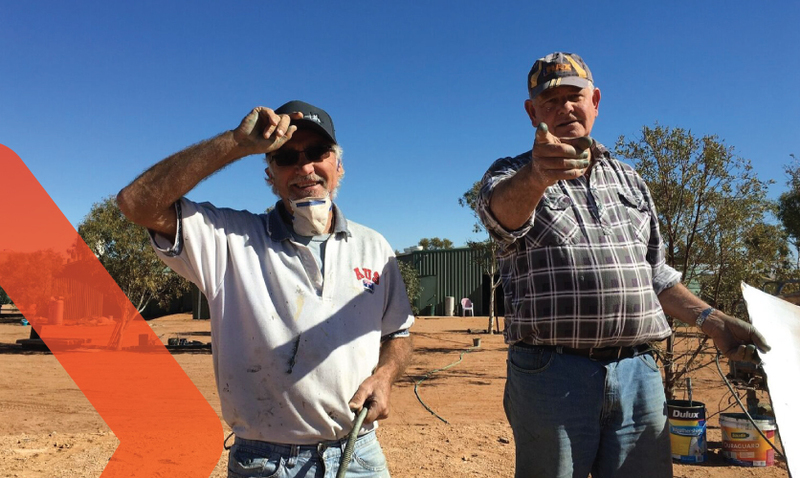 QLD - HADEN - Could you lend a hand to help Eileen and her husband paint their house? Activities: Eileen and her husband need your help with getting a fresh coat of paint on their house. Since they both have arthritis in their hands, they are unable to do this themselves and it’s hard to find a local painter in such a small remote town. If you think this is something you can help them out with – please get in touch! We look forward to introducing you to this lovely couple. QLD - SPRINGSURE - Are you able to lend invaluable, general helping hands to sisters around Springsure? Activities: Lorna and Colleen are sisters and are custodians of a sandstone property from 1862. They are both almost 90 and run things between them. To say they work hard, would be an understatement. Their family are working on a long-term solution with them so have reached out to Outback Links volunteers in the interim to assist in relieving some of the relentless pressure. Tasks would include gardening, old maintenance jobs on stone and slab buildings, some cooking, some cleaning and some valuable assistance running their small tourism operation to the property. If you are willing to put your hand to anything and everything and go with the flow, this would be a very rewarding placement. Accommodation: Plenty of room for caravan parking and access to water and power. Access to shower facilities can be arranged if necessary. WA - CADOUX - Are you able to lend a hand to a single parent farmer reaching out for help? Activities: A grazier has called us for back up support as he currently lives alone on his property whilst his three sons are away. He is looking to go and visit them at some point coming up however is unable to leave the property without care. Can you show the spirit of mateship? Showing that you care and lending not only your practical hands but also you listening ears would be priceless on this placement.